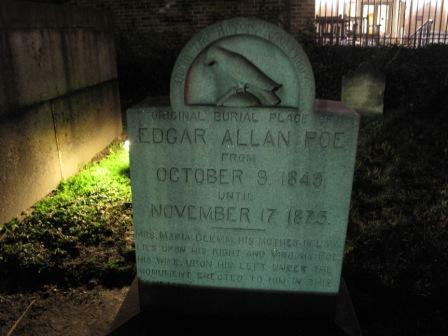 Poe Forevermore: Photos of the Recent Poe Event in Baltimore! 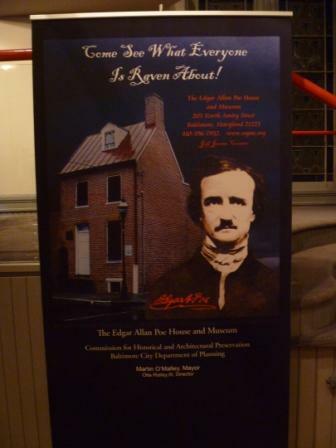 For many years, the Poe House and Museum in Baltimore has held a celebration in honor of the writer’s birthday. 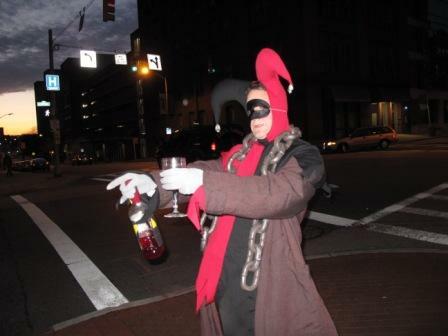 In the past, Poe fans flocked to the event, usually held in January for one or two weekends. 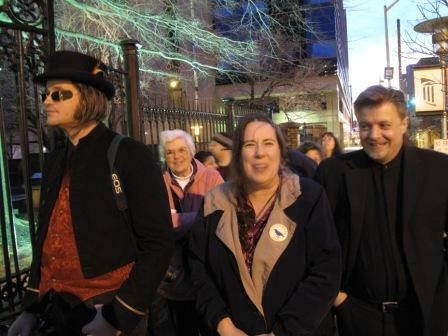 This year, there was one performance on March 3, and we were lucky enough to once again hit the road for Baltimore and attend. Although we are still waiting on word as to what will happen with the Poe House, this performance could very well have been the last of its kind—most of you know the city of Baltimore cut the house’s funding in 2010, and according to Jeff Jerome, the reason it has stayed open longer than originally planned is due to private donations and high attendance at fundraising events. Charles and Nathan on the corner near our hotel. 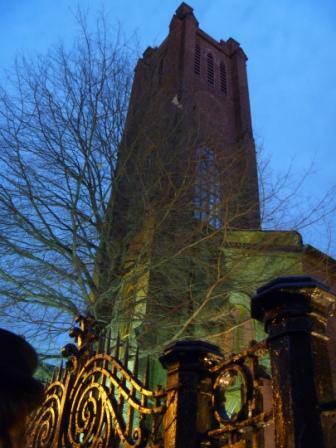 We usually stay at the Sheraton a few blocks from Westminster Hall, where the concert is held. 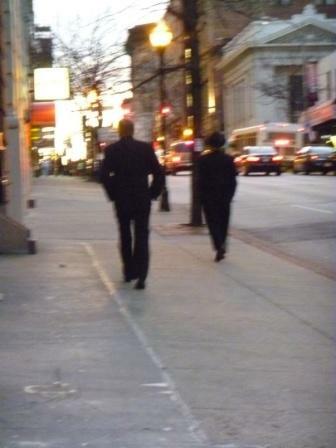 Charles and Nathan walk toward our destination as dusk settles on the city. 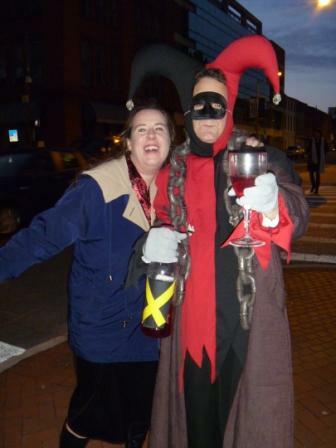 And here I am with Fortunato, wishing I had some real amontillado! VIDEO: See Fortunato in action! The imposing tower of Westminster Hall rises into the early evening. I have no idea what we were doing here, but I love our expressions. 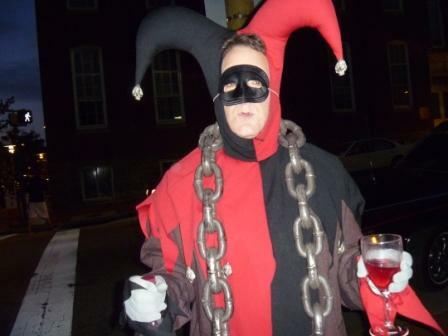 Also, check out the guy in costume—there were several attendees dressed in costume, and I wish I’d brought one of mine because I’d actually considered attending the concert in the gown I’d worn to our Edgar Allan Poe Dinner in 2000. 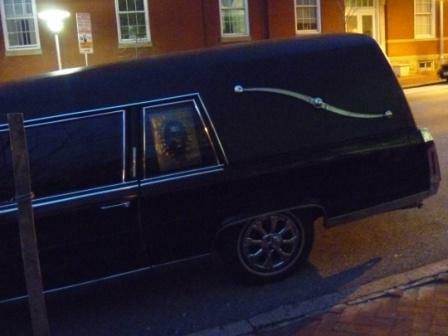 The back of someone’s hearse parked outside of the Westminster Hall gates. 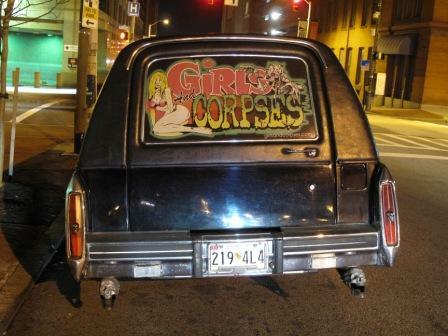 The hearse obviously is connected with something called Girls and Corpses—this could be the famous magazine, but the logo doesn’t match, so it could be a local band or something similar. A web search didn’t help much in clarifying. 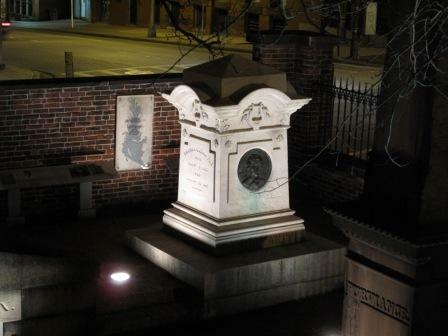 A shot of Poe’s monument. 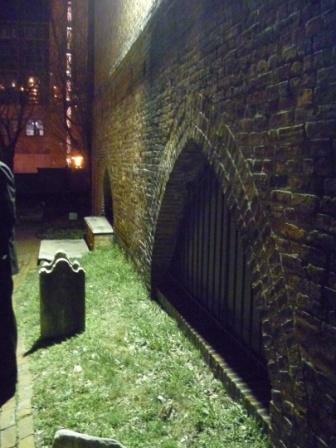 According to the Edgar Allan Poe Society of Baltimore, yes, his bones really are under there: http://www.eapoe.org/balt/poegravd.htm, although this is not the original location of his burial. A shot of a poster from the 2004 (I think) celebration. We framed it and we have it hanging in our dining room. 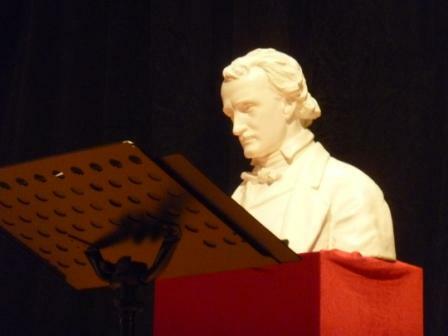 The pallid bust of Poe has presided over several celebrations. He’s not always on stage, but he’s always somewhere. 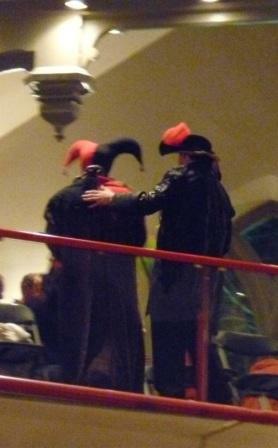 Fortunato and Montresor entertain on the balcony. 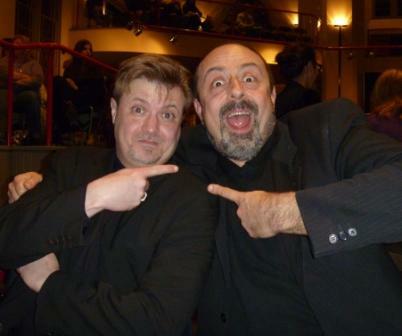 Below: Nathan, left, with Weird Maryland’s Matt Lake. We met him for the first time at the Poe event in 2007 and have run into each other at paranormal events on and off in the past few years. 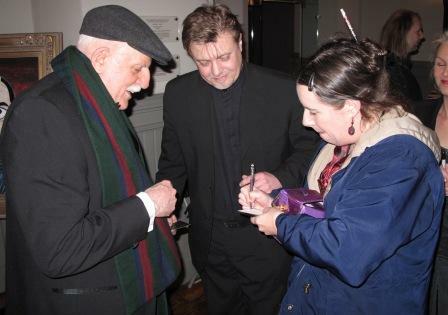 Below: Matt signs a copy of Weird Maryland for a fan while Nathan looks on. 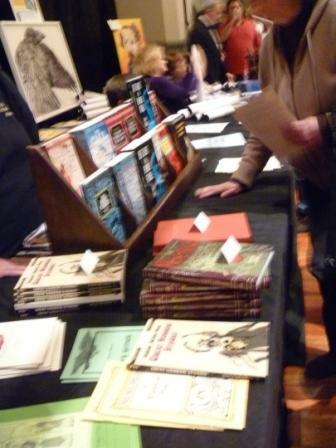 The sale table—always has lots of good Poe-related memorabilia, but my favorite things to buy are the academic studies published as chapbooks (I have quite a massive collection, even though my housemate Charles has me beat. 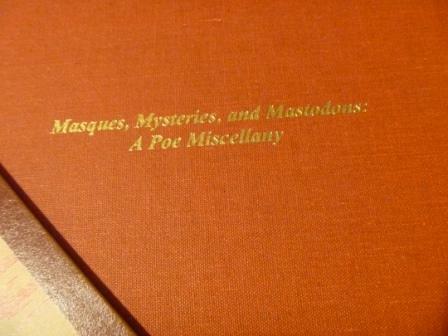 And yes, I actually do read them). I check out an issue of the newly-established Monsterpalooza while the crowd takes their seats (notice the packed house). 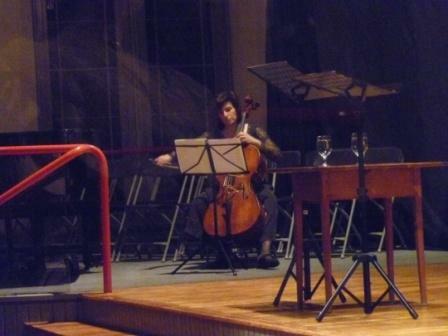 Cellist Gretchen Gettes opens the concert. It was the last shot I was able to get; no photography of any kind during the performance by anyone other than the Poe House’s official photographer was permitted. 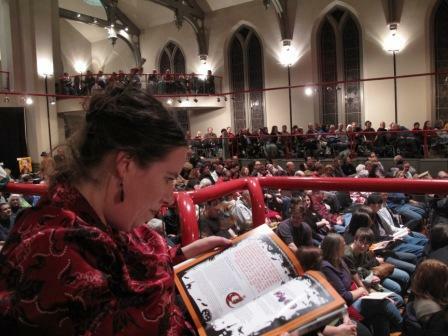 I’m not going to write a big, beautiful review of Poe Forevermore; what follows here are a few things I pulled from the notes I was taking at the concert for the benefit of those who would be interested in its content. 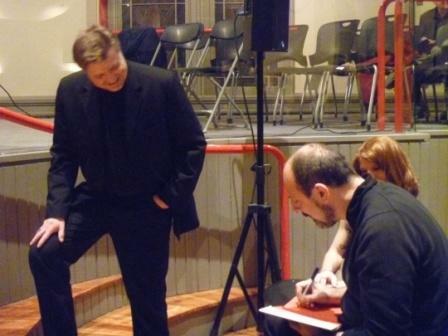 Cellist Gretchen Gettes opened the evening before Melanie Armstrong, John Spitzer, Mark Redfield, and Tony Tsendeas (well known to Poe Concert goers) took the stage with a clever program that told the story of Poe’s connection to Baltimore through letters and poetry. 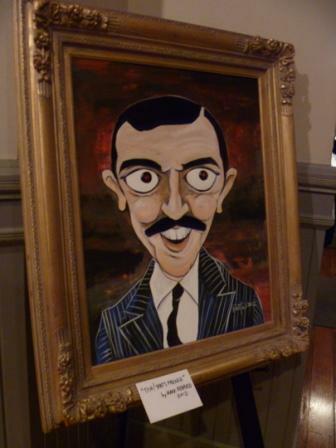 John Astin: “Then he lost his foster mother and there’s a poem I think is appropriate for his lament…he wanted to say goodbye to her, but he was called back from the army too late, and so as he was looking at her in her coffin, I imagine him saying [reads “A Dream Within a Dream.”]…Then there’s something I think is so brilliant about [Dream]…he states [All that we see or seem is but a dream within a dream”] at the end of the first stanza, and then he asks it as a question the end of the second.” (Kristi: The juxtaposition exhibits the very tenuous quality of dreams themselves). 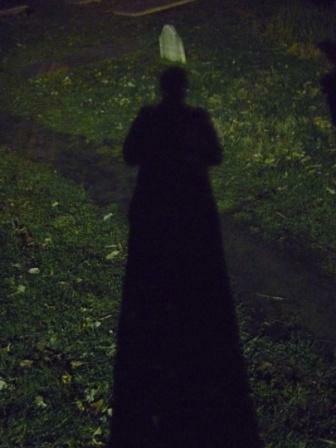 Astin presented “For Annie” and lines from “…one of the greatest of Poe stories…‘Ligeia.’ We know that she has been his wife, we know that she is dead, but he can barely remember where they met,” Astin said, citing a key passage which hints at one of the story’s main themes: transmigration of the soul. 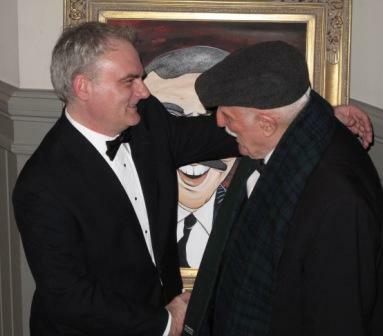 The night closed with parting words from Astin and Jerome as well as the traditional toast. 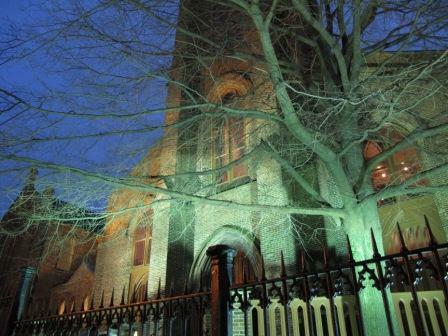 Knowing that this could be the last event made this emotional for everyone including audience members; there was a strange solemnity afterwards: no one wanted to stay, but no one wanted to go, either. At least for me, there was a sense that once I stepped away I wasn’t coming back. I hope this isn’t the case, and that there are many more celebrations in my future. 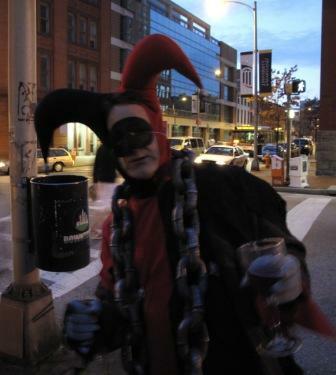 I’ll always visitBaltimore—I’ll need my annual Annabel Lee Tavern fix, for sure—but something will be missing if the Poe House is gone. 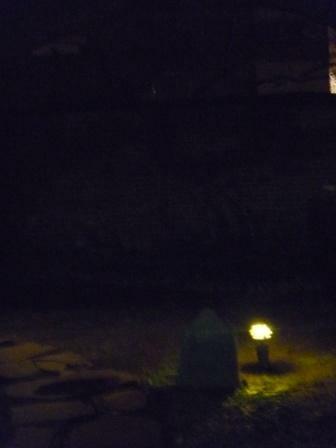 The stone marking the original burial site of Poe. The stone was commissioned and placed too near one of the cemetery walls in 1913; in 1921, it was moved to its current location, which I believe is considered the correct spot. 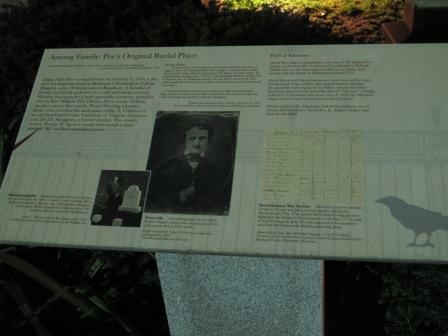 More information on the stone. Not a great picture, but this is one of my favorite spots in the cemetery—there’s a tiny path that winds past that little gravestone on the right, past a gnarled tree on the left, and around the corner. I’ve never been back there. I don’t want to ruin the mystery. This is another favorite spot of mine. 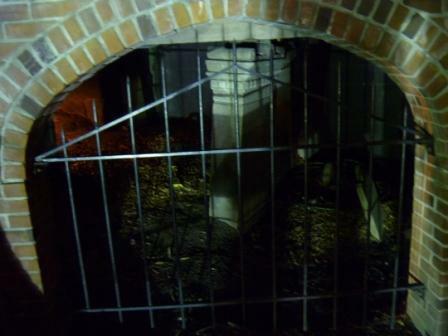 This is beneath Westminster’s front entrance. I love that there are stones underneath another structure. 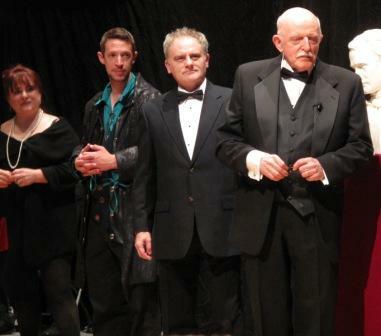 Melanie Armstrong, the gentleman who played Montresor, Mark Redfield, and John Astin take their bows. 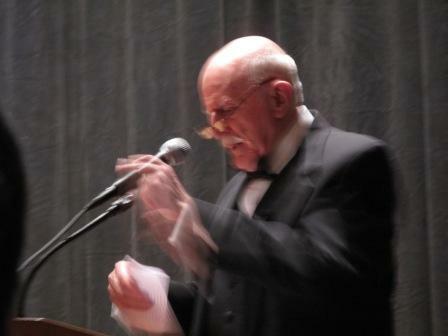 John Astin shares with the audience. 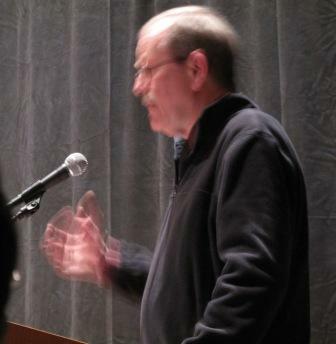 Jeff Jerome gives the audience an update on the future of the Poe House and Museum. 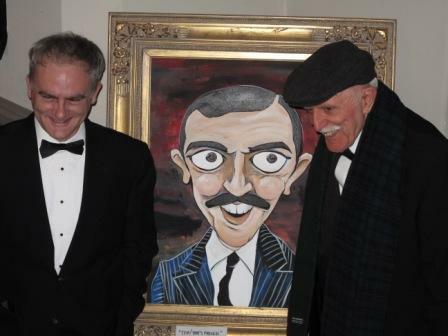 Mark Redfield’s painting of John Astin as Gomez. 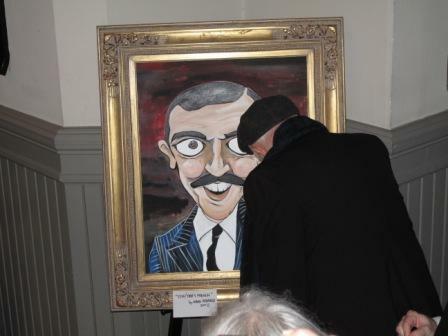 John Astin signs Redfield’s work. 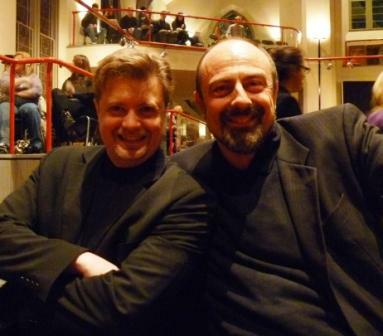 Redfield, left, and Astin pose for photos. Redfield and Astin shake hands. 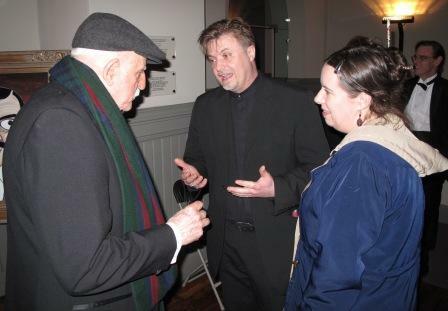 Below: Nathan and I get a chance to chat with John Astin. 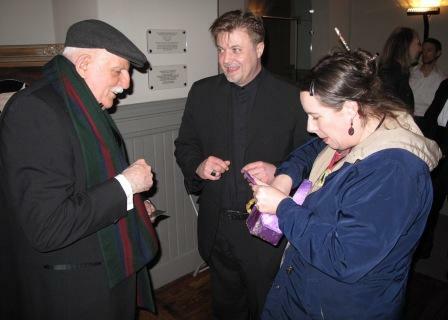 He’s one of the most gracious men I’ve ever met. 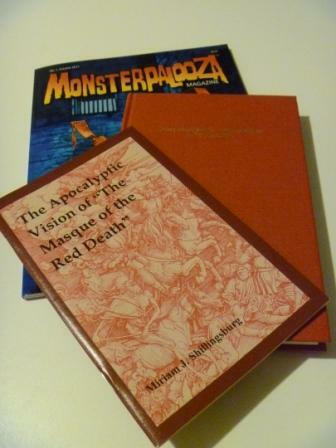 Below: The goodies I picked up at the souvenir table; Charles is particularly jealous of the book on the Red Death. I think it’s the only one he doesn’t have and there appeared to only be one copy for sale so I grabbed it. He’s not going to let me live this one down, I can tell you! 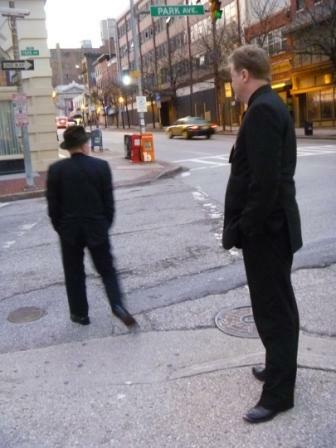 Posted on March 24, 2012, in Deep Thoughts & Fun Stuff and tagged Edgar Allan Poe, Edgar Allan Poe House Baltimore, Jeff Jerome, John Astin, Mark Redfield. Bookmark the permalink. Leave a comment.